Happy October! It’s Day 1 of the 31 Day Writing Challenge! For the next 31 days, I’ve committed to posting something every day about ballroom dance. Since my ballroom dance journey is the focus of this blog, my topic choice is obvious. My challenge to myself is to write something new every day. I don’t want to just rehash older posts about ballroom basics. I respect and appreciate my longer-term readers too much to produce nothing but reruns for a month. But I don’t want newer readers to feel lost, like they came into the middle of a movie. So my plan is to revisit some old topics with a new or different perspective, as well as break out some new ones. I will also include links to my previous posts to help any new readers get up to speed. For today, I thought I would just introduce myself to any new readers out there. 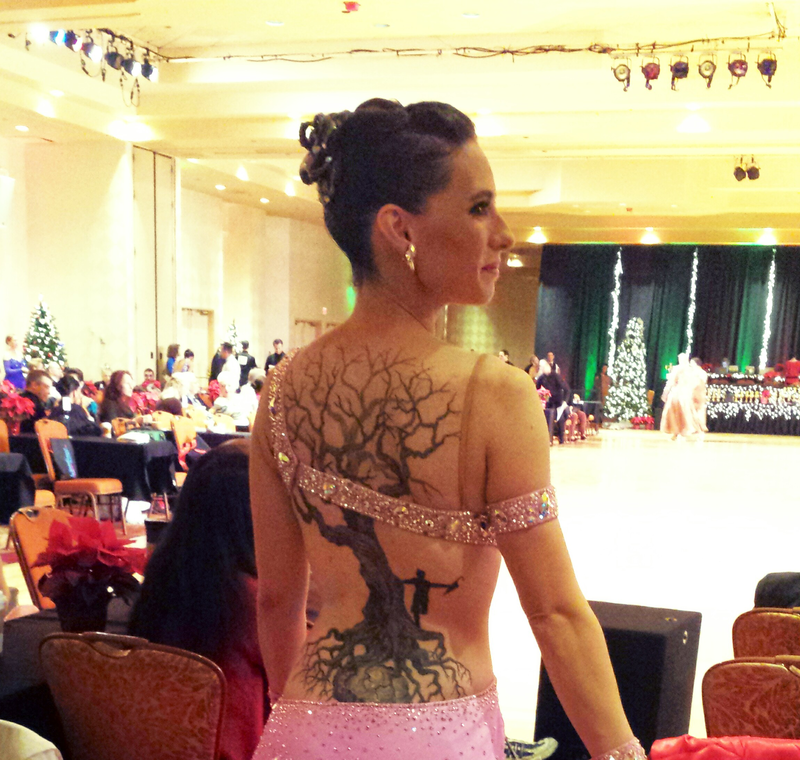 I am known as the Girl with the Tree Tattoo and I love ballroom dancing. Ok, I’ll be honest, I’m addicted to ballroom dancing. Never in my life have I experienced anything quite like it. You walk into a studio thinking you’re just going to learn some fun dance steps, but you end up going through an incredible journey of transformation and self-discovery. I have been dancing for almost three years and competing for about a year and a half. My name came from the tree of life tattoo I have on my back, including a silhouette of Gene Kelly from Singin’ in the Rain as a symbol of my love of dance. I’m currently recovering from a bit of a setback. I was supposed to compete in the United States Dance Championships in September for a national title and the “Best of the Best” event at Ohio Star Ball in November. But a week before USDC, my teacher broke his wrist. You can’t dance ballroom with a cast, and unfortunately, his recovery schedule does not correspond with the timing of Ohio Star Ball. So after nine months of planning and preparation, two dreams were snuffed out. Teacher had surgery to repair the fractures in his wrist and he is still in a cast for several more weeks, but he is back in the dance studio teaching again. I am slowly letting go of the lost dreams and building new ones. Something any new reader should know about me is I always strive to keep my writing honest. Painful honesty with a side of dark humor is how one friend describes it. I take all of my dark thoughts and feelings and expose them to the light. I struggle daily with what I call my demons, which include my self-doubt, my fears, my anxieties, my trust issues, etc. My goal with this honesty is to let others who might be struggling know they are not alone. And know that if I can still pursue my dreams, so can they. I’m excited to participate in this challenge and hope you will join me! I have lots of ideas for this month from reviewing ballroom basics to practical matters like how the heck I can afford to dance to deeper issues like learning to trust my teacher as my dance partner and struggling to believe in myself. I also left room for spontaneous posts whenever inspiration strikes (which is where Day 2’s post is coming from)! I will link each day’s post to my 31 day writing challenge announcement so you don’t have to hunt around for them. Let the writing and dancing begin! Partnering in Ballroom and a Free eBook! I was so excited to find your blog on 31 days! I have been exploring your site & it has brought back many wonderful memories. I loved the videos and seeing so many familiar dancers in the background (I competed for a while myself). I just wanted to encourage you in your posts, I love your honesty & vulnerability. Although I was able to compete in Ohio, trophies and medals have taken a back burner to the amazing lessons I learned along the way. Looking forward to hearing more of your story. Hi Carolina! I’m pleased to make your acquaintance! I love meeting other ballroom dancers. Thank you for the encouragement, and I agree – the placements are secondary to the experience! As a former ballroom dance instructor and lover of ballroom dance, I was excited to see you on the 31 days list! Looking forward to reading you this month! Yay! I love connecting with other ballroom dancers! I thought I might be an odd duck in this challenge but a bunch of fellow ballroom dancers are coming out of the woodwork. Love it! So the challenge is off to a good start for you. I thought about it but didn’t think I had the discipline to make it each day. Maybe I’ll comment on each of your posts. Would that count 🙂 Actually, it is great to see some other ballroom folks here. Haha, I love it! A 31 day comment challenge! I’m looking forward to the your posts over the coming month, sorry that things haven’t gone to plan like you wanted. – BTW – awesome tatoo!